Equipped with a pair of period-correct single-coil pickups, the Fender American Original '60s Jaguar delivers all the snarl and punch you expect from Fender's offset guitars. Its Pure Vintage '62 pickups are wax potted, with enamel-coated coil wire, and feature flush-mounted pole pieces just like original Jaguar pickups. And its maple neck with mid-'60s "C" profile fills your hand without feeling too chunky. Factor in vintage-tall frets for precise playability, and the Fender American Original '60s Jaguar offers everything a Fender offset fan could ask for. Fender designed the Pure Vintage '62 pickups in the American Original '60s Jaguar to be as period-correct as possible. That means enamel-coated coil wire, cloth-covered output wires, Alnico 5 magnets, and flush-mounted pole pieces. Need to cut through the mix even more? Engage the Jaguar's bass-cut switch to cut lows and focus your mids and highs. We're often asked at Sweetwater what a "round-laminated" fretboard is — it simply means that the rosewood fretboard is carved with a radius on both sides, and the maple neck is carved with a radius too. Compared to slab-style fretboards, where the fretboard and neck have flat surfaces where they join, round-laminated fretboards are more resistant to warping and de-lamination. It's true to Fender's mid-'60s construction methods and ensures a lifetime of reliable performance. 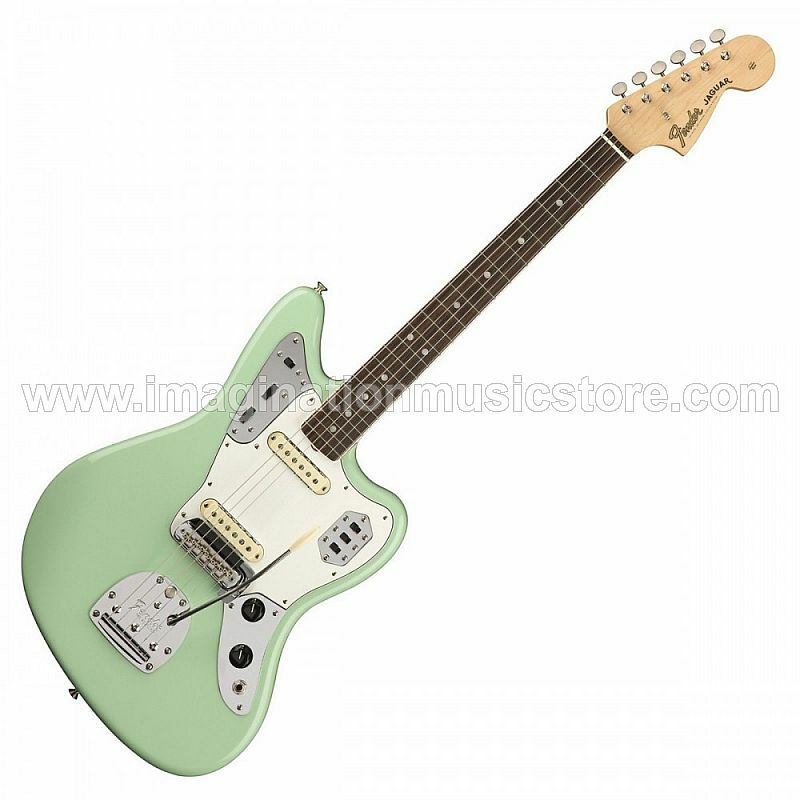 The Fender American Original '60s Jaguar is a treat to play, largely because of its vintage-style neck profile. This is a pleasantly stout neck, and its increased mass yields an incredibly natural feel, as well as excellent sustain. And wait until you experience the fast-playing bound rosewood fingerboard with narrow-tall frets. Bending notes and playing chords high on the neck have never been easier.